We perform this step using Adobe Photoshop software, version 5.0 or higher. Some basic knowledge of this software is needed in order to mount the immuno-FISH pictures. The following instructions are one example of how to do it, but other procedures or imaging software may also be used. 1. 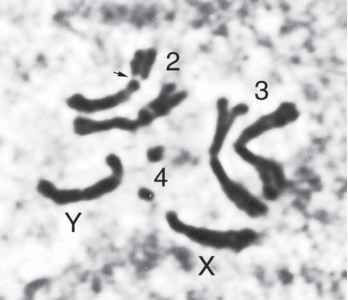 Select the best chromosomes for image analysis. In cases where the antibody staining survives FISH, from the digital camera attached to the microscope acquire three pictures for every selected chromosome with appropriate filter sets: one for the antibody staining, one for the FISH signal, and one for DAPI staining. If the antibody staining does not survive FISH, image acquisition of immunostained chromosomes at marked slide coordinates will already have been done as described in Subheading 3.2., and at this stage of the experiment, separate acquisition of the FISH and DAPI images is performed on the same chromosomes. 2. At this stage, three images are available for every chromosome: a DAPI staining, an immunostaining, and a FISH staining. These images are 8-bit "Indexed Color" tiff format files. 3. In order to produce properly aligned color pictures, open all three files in Adobe Photoshop. Convert all images from "Indexed Color" to "RGB" color mode (Menu: Image ^ Mode). 4. Choose one file (usually it is the DAPI stain) and transfer the content of the other two files to it. This can be done by selecting each image to be transferred (Menu: Selection ^ Select all), then "Copy" and "Paste" to the target image. The resulting image will look the same, but now it is color coded. This means that each of the three layers contains three channels: red, green, and blue. Save this three-layered file as a new file with a different name, with the .psd extension. 5. Align the three image layers by moving the layer content by the arrow keys ("Move" tool from the Photoshop toolbox) (see Note 9). The morphologically common details on all images, such as the chromosome contours, should coincide. Finally, crop the image to the zone of interest ("Crop" tool from Photoshop toolbox) and save the file. 6. Create pseudocolor pictures for each layer. From the "Image" menu, go to "Adjust" ^ "Levels." The dialog window shows the color channels on top, the input levels in the middle and the output levels at the bottom. In order to obtain the correct color for the DAPI image, select from "channels" the red one and set the output level at zero. Thus, only blue and green are left, resulting in a cyan color. Then, go to the input levels and adjust in order to obtain the proper staining intensity. Confirm by clicking "OK." In order to obtain a red color for the file corresponding to the red fluorochrome staining, go back to the layers and select the appropriate one. Select again "Adjust" ^ "Levels." Set the output level of the green and the blue channels to zero. Now, only the red is left. Select the input levels in order to adjust the intensity and confirm. For the green color, repeat this step, but now setting to zero the output levels of the red and the blue channels. 7. Visualize each channel by selecting or unselecting each of them in the "Layers" dialog box (the icon of an eye appears in a check box flanking the appropriate layer upon selection). For a view of the overlay image, switch the view mode from "normal" to "superimposed." 1. The fixation time in solution 2 needs to be adjusted for each individual antigen. Thirty seconds are good for most antigens. Longer times may be required for very basic proteins. For example, 5 min are required for histone staining. 2. Primary antibody dilutions have to be empirically adjusted using serial dilutions. When testing new antibodies, one should first determine the optimal working concentration in a Western blot experiment. In most cases, the optimal concentration for polytene chromosomes ranges between 10-fold and 100-fold higher than the one used for Western blot. Signal intensity and background level depend critically on primary antibody concentration, therefore careful analysis of this parameter is required. Note that the optimal dilution often differs from the ones used in immunostaining of other tissues. Use affinity-purified antibodies whenever possible. For antisera, it is recommended to preabsorb against embryos. 3. If background problems persist, the NaCl concentration can be raised to 550 mM. 4. For the secondary antibody, optimal working dilutions should also be tested, but this parameter is less critical than for primary antibodies and it is often close to the manufacturer's instructions. Always include a negative control slide with secondary antibody in the absence of primary antibody. 5. The serum used for incubation with secondary antibody should be from the same species as the one in which the antibody has been raised. 6. In FISH experiments, the signal from the fluorescent-coupled streptavidin can be amplified. In this case, after incubation with the streptavidin conjugate and washing (see Subheading 3.4.4., steps 3-5), incubate slides with biotinylated antistreptavidin antibodies (Vector Laboratories), diluted in the same buffer and in the same concentration as streptavidin. After antibody staining, wash the slides as in Subheading 3.4.4., step 5 and again incubate with the streptavidin conjugate (Subheading 3.4.4., steps 3-5). 7. Postfixation of the immunostained signal can be also performed after cytological analysis of immunostaining, if necessary. In this case, after image acquisition of Mowiol-mounted slides, remove the Mowiol and cover slips by washing in PBS for 1 h with mild shaking. Wash once more in PBS for 5 min. After this step, proceed to Subheading 3.3.1., step 1 or Subheading 3.3.2., step 1, as appropriate. 8. The time of postfixation should be optimized. Longer fixation times improve the stability of the immunostaining signal after FISH. However, they will correspondingly reduce accessibility of the chromosomal DNA to the labeled probe during FISH and thus reduce the FISH signal. We often found 15 min to be the best compromise between preservation of immunostaining and FISH sensitivity. However, we suggest performing preliminary experiments with postfixation times ranging from 10 to 30 min. 9. Alignment of the three image layers in the Photoshop compound image file is necessary—in particular, in the case of separate immunostaining and FISH-staining image acquisition. However, this is often needed even in case of acquisition of all images at the same time, because acquisitions with different filters may result in images that are offset by a few pixels. This is the result of suboptimal microscope settings and can be corrected by proper microscope adjustment.